Chef Skyler Dees standing outside of his childhood home on 16th Street in North Lawndale//Photo by Morgan Elise Johnson (The TRiiBE). Skyler Dees is done waiting for some mystical white savior to ride omnisciently into North Lawndale in a glowing chariot, wave his curative wand and, thus, save Black people from themselves. Historically this approach hasn’t worked out in Black folks’ favor, Dees says, thinking of the erasure of Black life from razed and now whitewashed neighborhoods such as Cabrini Green. So he’s taking matters into his own hands – empowering his childhood North Lawndale community by changing the way they think about food and sustenance. He’s doing so through his catering startup, Skyler Dees Catering Company, which he founded in October 2016. “When you deny a person nutrients, anything that they do is an automatic reaction [to] them being hungry or them not having the proper nutrients to have a balanced brain,” Dees, 27, explains. In North Lawndale, there aren’t many nutritious options to choose from. Residents often refer to the West Side neighborhood as a food desert, according to dnainfo.com. All of the major grocery stores lie miles away on the outskirts – Pete’s Fresh Market in East Garfield Park, Cermak Fresh Market in Cicero, Save-A-Lot in West Garfield Park and Leamington Foods in Homan Square. When it comes to fresh and high-quality produce, however, residents say Leamington Foods comes up short, Austin News Weekly reports. As for restaurants, there are fast-food joints such as the ever-present McDonald’s, and the mom-and-pop favorites that sell fried chicken and mild sauce, fried fish and italian beefs. But there aren’t many alternative options. For example, Dees notes, there isn’t a Chipotle or restaurant chain with fresh ingredients within miles of North Lawndale. “There’s a population here [in North Lawndale] that wants to eat kale salad with honey lemon dressing,” Dees says. That’s among the dishes he’s made for kids in the Young Men’s Educational Network, an educational and mentoring program where Dees served as chef-in-residence for the 2016-17 school year. Dees remembers how much the kids enjoyed his meals. He says some of the children expressed that they’d never had a seven-grain salad with tomatoes and cucumbers, or a chicken thigh on a skewer seasoned with fresh lemon and garlic. Dees learned how to cook out of necessity. He grew up in his grandmother’s 3-flat, each floor filled with family. On the days when his grandmother or aunts hadn’t cooked before he and his cousins returned home from school, Dees would take his turn in the kitchen. Skyler Dees at his “Gourmet Grill: Our Solution” community dinner and conversation on Oct. 20//Photo by Morgan Elise Johnson (The TRiiBE). After brief stints in college, Dees joined Safe Haven Foundation’s culinary arts program. 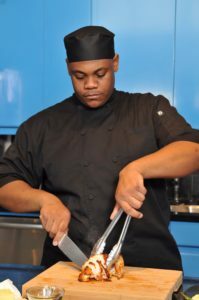 He eventually worked his way up the ranks – from student to intern to sous chef and catering manager – within two years. In 2016, when Dees took a job as a chef trainer at Inspiration Kitchens, he hit a turning point in his career. He realized that his beliefs in teaching culinary arts to people from underserved communities didn’t align with the teaching model of his 9-to-5 job. Dees dreamed of cultivating a safe space for potential cooks which takes their histories and interactions with systemic oppressions into account. So Dees put in his two-weeks notice in September 2016 and began building his catering company the following month. “There’s no purpose [in keeping] a 9-to-5 and still being underappreciated as a chef and teaching participants who really want to learn culinary arts but really are affected mentally by the circumstances we have to operate under,” Dees says. 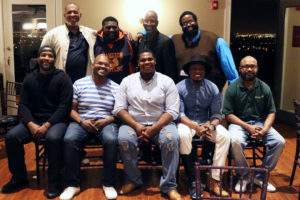 Most of his participants, at the time, were people trying to get back on their feet after battling drug addictions, time in prison or poverty. “North Lawndale didn’t have any of this, and Safe Haven [Foundation] is on the outskirts. Inspiration Kitchens is in Garfield Park. So I have the perfect [opportunity] to slide in here and start my own culinary arts program and get some people some jobs,” Dees continues. Dees initially raised thousands of dollars through online fundraising campaigns, including GoFundMe, to get his catering company off the ground. 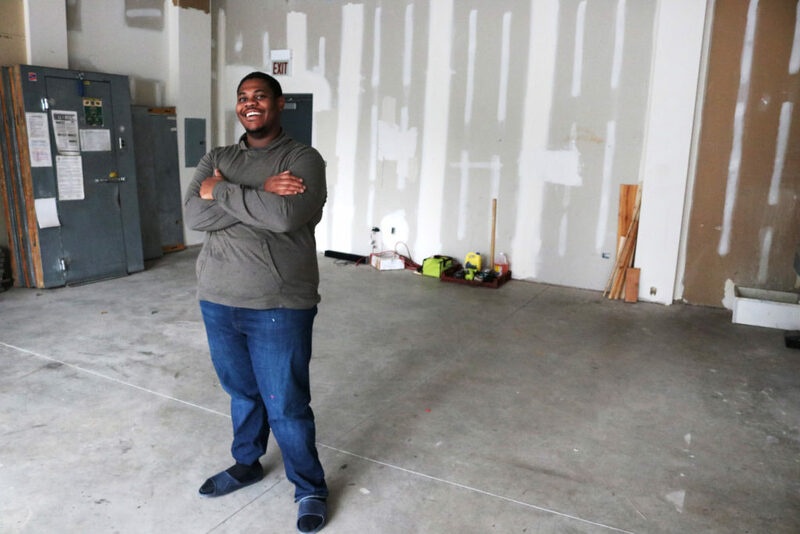 In May 2017, he won the inaugural Mayor Rahm Emanuel’s Neighborhood Opportunity Fund, which awarded a grant to help Dees build out a commercial kitchen in the Dr. Martin Luther King Jr. Legacy Apartments building on 16th Street near Pulaski Road. Skyler Dees posing inside of his unfinished commercial kitchen in North Lawndale//Photo by Morgan Elise Johnson (The TRiiBE). 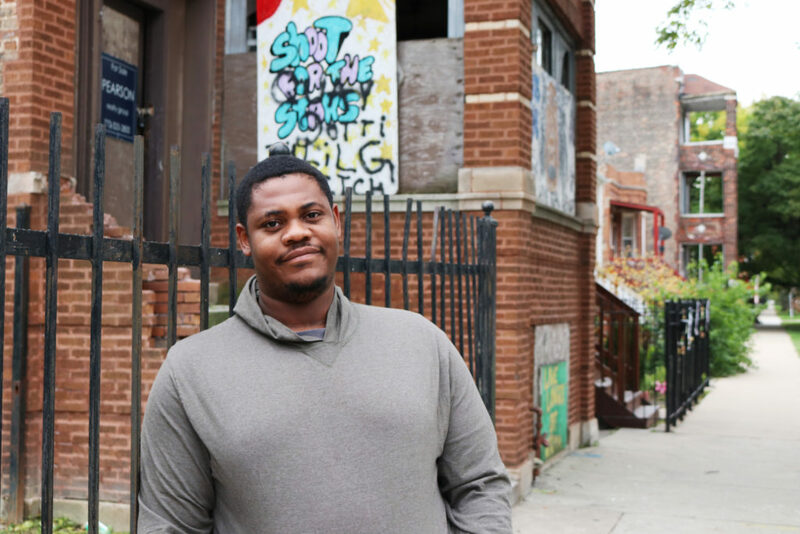 Before owning a car, Dees took public transportation or an Uber to deliver lunches he made for people working in North Lawndale – so they didn’t have to travel outside the community on their lunch breaks to get a healthy meal. He’s catered events hosted by the Pritzker Foundation and Chicago Community Trust, he says. He’s also organized community events where he’s collaborated with other Black millennial entrepreneurs in North Lawndale, such as Alexie Young (Invizion Colorz) and Naimah Muhammad (Royal Divas Body Butter), to illustrate the importance of supporting local Black-owned businesses. For Dees, building a better North Lawndale extends beyond the stratosphere of his catering company. It’s about community, and helping one another successfully fulfill their dreams and roles within that community.